It’s the definitive list of shows to watch and casino games that compliment them, just for you couch-potatoes and marathon watchers! And, as always, please don’t forget to Netflix and binge responsibly. What’s not to love about spandex clad glamazons beating the crap out of each other in my new favourite wrestling-themed Netflix original, Glow? This group of lovable misfits, the self-styled Gorgeous Ladies of Wrestling, makes this show perfect for a good ol’ bingefest. Plus, while you’re watching these kickass babes in action, why not take a flutter at one of my top slots, Bulletproof Babes. With great features, an awesome storyline and stellar graphics, this game’s got it all. You know you’re in for a bloody (and I do mean bloody) good time when there’s Vikings involved, and this show’s got the whole horde of them. Plus, the missus can’t take her eyes off pretty boy Alexander Dreymon (‘Why can’t you look more like him, Joe! Wah wah wah’). Check out Vikings’ Victory to pair and you’ve got yourself a binge-sesh that could potentially make you a bit of money. The big prize of 5,000X your bet per line is just another added bonus. Just like a good mystery or horror novel, Mindhunter’s one of those shows you won’t be able to walk away from, at least not until you’ve finished it all in one go. Think FBI agents, real-life criminals (we’re still waiting for the show’s take on Charles Manson) and a dark, gripping storyline that’ll thrill you as much as it’ll teach you a thing or two about criminal psychology. There’s a chance you might not be able to sleep at night after witnessing the twists and turns this show’s got in store for you. In which case, make the most of your insomnia and night terrors by playing Reel Crime at my casino and put your newfound detective skills to the test! I didn’t think I’d end up liking this one because, well, Drew Barrymore, but it turns out Drew Barrymore as a zombie realtor is way more palatable. Only one season out so far, but it’s a hilarious, and at times raunchy, dark comedy that should, in the least, make it to your ‘My List’ selection. And while you’re watching Drew blend down her victims into drinkable smoothies, play Zombiezee Money and take on the undead for a chance to win. Last but not least, Stranger Things is one of those zeitgeist shows (like Game of Thrones) that you have to watch otherwise no one’s going to want to talk to you at Sharon’s dinner party, and you didn’t even want to go anyway. With its campy 80s theme and everything from spooky government experiments to massive alien invasions, this show’s definitely worth a viewing marathon all while you play Aliens Attack at Joe Fortune casino and spin your way to some intergalactic winnings. 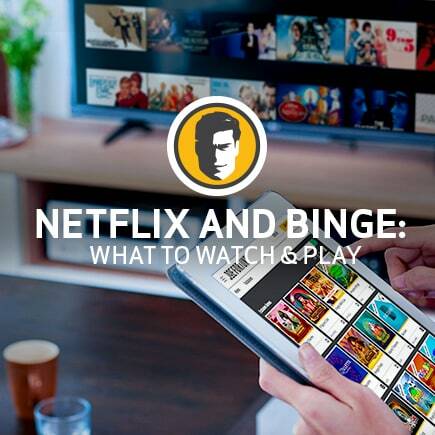 I’ve got the games for all your Netflix needs, so head on over to my casino to check out the impressive roster of games.